Having the opportunity to see great theatre is a wonderful, even transcendent experience at times. Being able to see it twice is double the pleasure. Pillow Talking recently saw a production of The Invisible Hand at Hartford’s TheaterWorks with many of the same artists who crafted it at Westport Country Playhouse last year where we had been fortunate also to see it. Just like the first time, it blew us away. 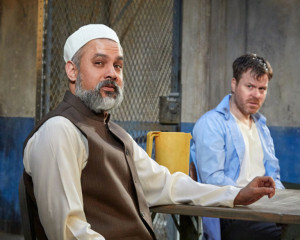 The most recent production presented most of the same cast: Eric Bryant as Nick Bright; Fajer Kaisi as Bashir; and Rajesh Bose as Imam Saleem; the notable exception is Anand Bhatt who plays Dar. 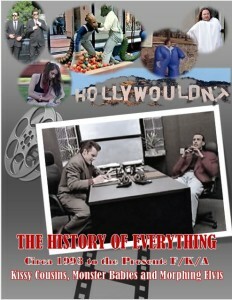 Both productions also were directed by the incomparable David Kennedy. Every artist was outstanding in their roles and newcomer to the troupe, Bhatt, afforded a seamless and nearly unnoticeable transition for us from the original as both actors embodied the roles of underling jail guard, Dar. In addition to the cast modification, there were two other major differences between the two productions: the location of the venue (obviously) and the set design. At Westport, the stage jutted out at an irregular angle which served to enhance the overall aesthetic in an almost jarring fashion. At TheaterWorks, viewing it on a smaller stage, in the intimate theatrical ambience made for a truly satisfying and engaging experience. Both venues delivered exceptionally, but in this second instance, being so near to the stage and actors gave us the chance to catch nuances and relive some of the poignant high points and motifs. Additionally, the more diminutive stage intensified the claustrophobic nature of the Pakistani cell in which all the action takes place. Now here we are, taking the middle ground and delivering equal raves about both versions. Ayad Akhtar’s The Invisible Hand’s powerful themes and thought-provoking issues come across exceptionally well in both productions. So as not to completely reinvent the same wheel (ours), and since the differences were both slight and noted above, we have elected to republish our prior reviews of Westport’s The Invisible Hand with this addendum. In closing, all we can say is that if you did not catch it in Westport, you must see this truly engaging, electrifying piece of theatre. And if you did see it, it is well worth a second go-round. It is a masterful work and this time, like we did, you may surely catch some of the nuances you might have missed the first time around. Combine any two substances that don’t ordinarily mix and you could get a toxic, corrosive, or downright explosive result. Combine two, or three, or four individuals from polar opposite social, political, ethnic, and religious walks of life, and you might find that you get a similar outcome. Or not. Because underneath two enormously dissimilar exteriors (take for example, an American banking executive and a group of Islamic militants), you’re still left with the human element. You’ve got beings simply made up of flesh and blood who possess the same instinctive drives shared by all people, regardless of geography or ideology. And that’s the crux and the questions of human existence – are we more alike than we are different? It is nature or nurture which shapes us? 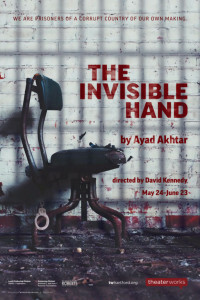 Westport Country Playhouse’s The Invisible Hand by Pulitzer Prize-winning playwright, novelist, and screenwriter Ayad Akhtar (who also penned equally as provocative works, Disgraced and The Who & The What), would have us explore the idea of psychic unity – because on many levels, there appear to be more commonalities than variances in our psychological makeup, experiences, and resulting behaviors. Despite vast differences in our surroundings and other superficial aspects of our lives, ultimately we are the same, and mostly driven to do the same things, make the same mistakes, reap or suffer the same outcomes. It is these psychological universals that may be at our core. Nevertheless, across the globe, no one would argue that we as a human race, clash in more ways than one ever could quantify. 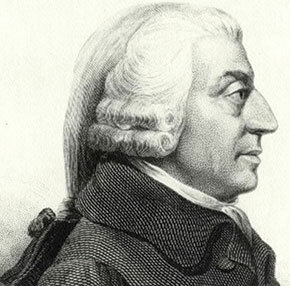 The term “invisible hand” was coined by economist Adam Smith in his 1776 book “An Inquiry into the Nature and Causes of the Wealth of Nations.” Its meaning speaks to the nature of capitalism through competition for resources; as individuals try to maximize their own wealth it ultimately benefits society. It is this invisible hand that guides the economy. It also is this idea which serves as the springboard for Akhtar’s tight, gripping drama. And while we may need only certain basics to survive (food, water, air) it is money that will afford us such things and it is the intoxicating, covetous pursuit of wealth that often never can be sated. When Nick Bright, an American banker working at Citibank in Pakistan, is mistaken for his boss, he’s kidnapped by a group of Islamic militants. Caring not that they’ve abducted the wrong person, the terrorists demand a hefty ransom for Nick’s safe return — $10 million. 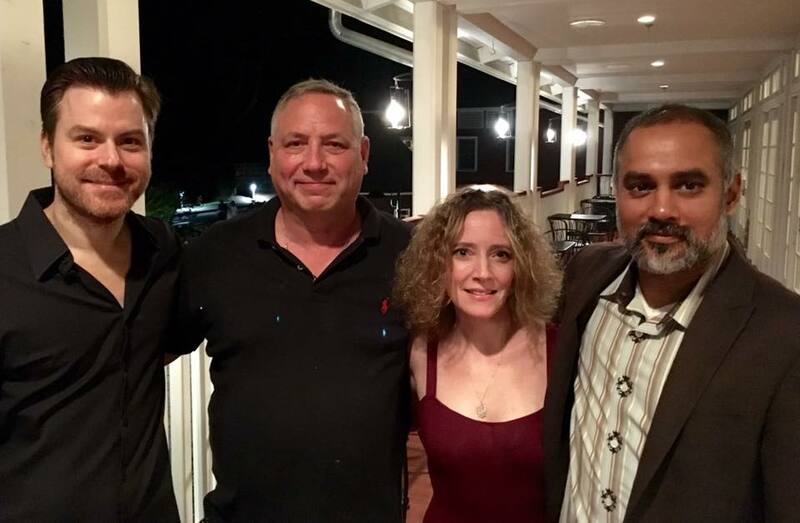 At the helm is Imam Saleem who purports that his true purpose is in trying to create better lives for Pakistan’s local citizens, but he’s on the Terrorist Watchlist and the U.S. will not negotiate. Realizing that there won’t be a rescue, Bright decides to use his tremendous knowledge of the stock market and his own nest egg to raise the ransom. The only way for this to materialize is to work side-by-side with his captors on a laptop in his cell, except that Nick only is permitted to supervise the transactions (he cannot be trusted to do them himself) and he must teach Bashir how to work the market. Clashing regularly over their differing world views, Nick never has the upper hand, even with Dar, the lackey he befriends and who does everything from clipping his nails to emptying his waste bucket. Quick-study, volatile Bashir keeps his mentor in his place through fear, intimidation, and threats of torture. Set entirely in Nick’s jail cell, this urgent, tense, and unpredictable thriller is at times grim, often witty, and always electrifying. And despite being a four-man drama, the almighty dollar is the malevolent and most central character. Eric Bryant as Nick Bright is phenomenally authentic, and you truly believe he’s shackled in a Pakistani cell, playing the stock market for his freedom and ultimately his life. His performance is riveting, rife with wry humor, and before your eyes he goes from a hotshot, cocksure banker to a strung-out, flailing, captive who is spiraling into darkness. Fajer Kaisi as Bashir is the deplorable and brutal captor whose loyalties seem to shift moment-to-moment but green is the color of his blood as ultimately greed is what drives him. Kaisi’s layered portrayal of this dark and complex man is a thrill to watch and you always feel he’s mere moments away from spontaneously combusting. Together Bryant and Kaisi have incredible chemistry as the alternatingly improbable allies and mortal enemies. Rajesh Bose as Imam Saleem is intense, dignified, and altogether chilling. Because of the uncertainty of what is brewing beneath his exterior, you come to dread every moment he appears on stage with the unpredictability and volatility of the developing situation; and like Nick, the audience never can let down their guard. Dar, played by Jameal Ali is excellent as the dutiful subordinate, seemingly eager to please both his superiors as well as the captive, as long as he’s getting something out of the arrangement. 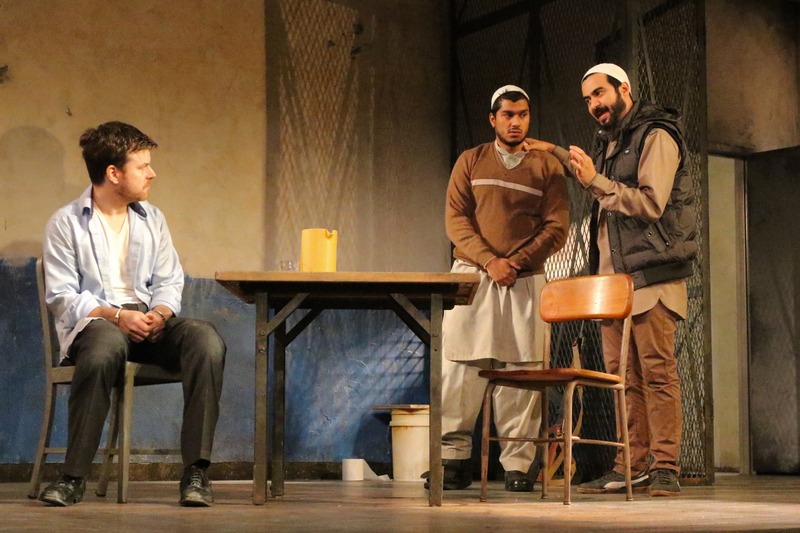 Director David Kennedy keeps the suspense and the tensions high, staying true Akhtar’s even-handed storytelling and addressing the conflicting positions of the characters. The play provides little time to think about the issues as the fast-paced tale unfolds, but it gives you pause from the moment the curtain falls, and keeps you pondering long after. It is what only great theatre can do – it makes you think, rethink, and think some more. Nearly as important as the incredible portrayals is the set – first-rate scenic design by Adam Rigg with the slightly askew and realistic jail cell which juts out over the stage’s edge. Emily Rebholz captured the feeling of time and place with spot-on costume design. Scenes changing from day-to-day, morning-to-night, with passing drones and gunfire were expertly handled by Matthew Richards’ lighting design and Fitz Patton’s sound design. 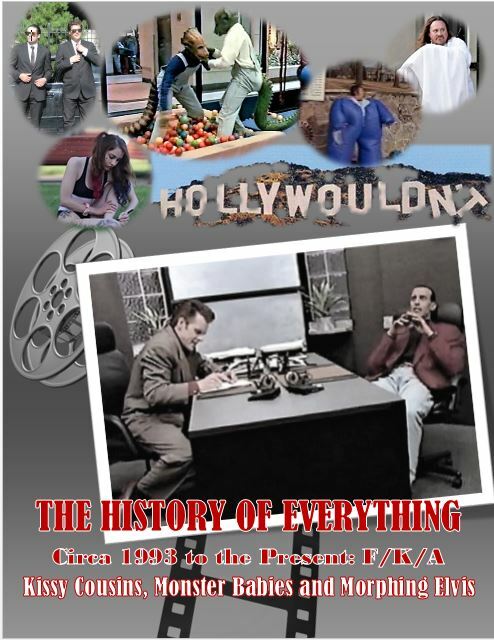 Kudos to Louis Colaianni for dialect coaching, Michael Rossmy for fight direction, Karen While for props, Tara Rubin Casting and Laura Schutzel CSA for casting, and Megan Smith for production stage management. One need not travel to New York City, as with The Invisible Hand, Westport Country Playhouse brings scintillating, intelligent, and thought-provoking theatre to Connecticut that keeps you on the edge of your seat. There is a plethora of great dramatic pieces that make the rounds in the theatrical circuit. On the other hand, there aren’t that many “thrillers” – plays that keep you on the edge of your seat; plays that can be called Hitchcockian in nature. Extremities is one that comes to mind. K2 and Equus are others. Ayad Akhtar’s The Invisible Hand certainly falls into that category. It is both a politically and socially charged thriller that keeps you on the edge of your seat. Indeed, in this case, one honestly can say that it deals with content that is truly ripped from the headlines. But it is so much more than that. It’s an examination into the values, mores, and traditions of conflicting ideologies and cultures. 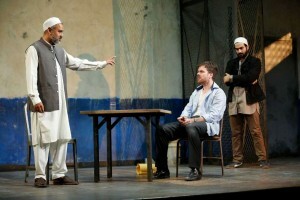 Mr. Akhtar is no stranger to thought-provoking and controversial theatre. His Pulitzer Prize-winning Disgraced, which deals with some of the same issues of cultural dissonance, works on more of a microcosmic, personal level, whereas the issues of The Invisible Handaddress more of a macrocosmic or global level. Westport Country Playhouse’s production of The Invisible Hand is electrifying. It’s like watching two trains headed for each other at breakneck speed and there isn’t a damn thing you can do about it but wait for the inevitable collision and hope there is something salvageable in the aftermath. 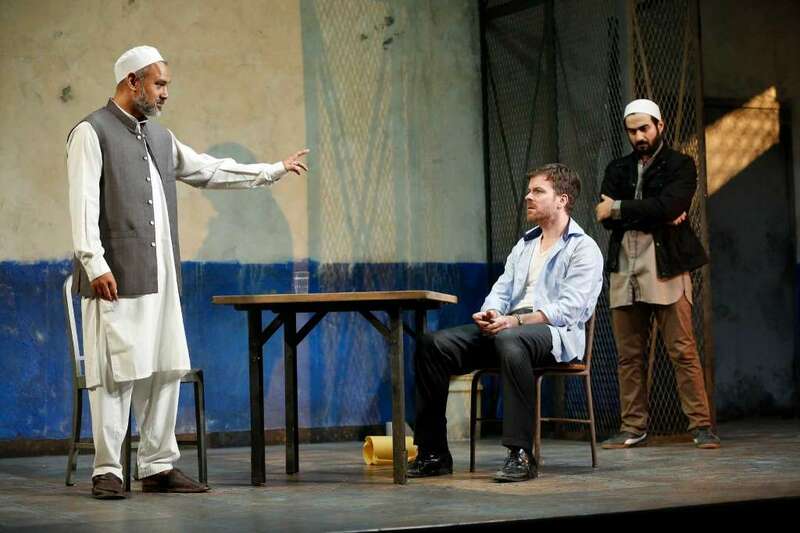 In the play’s case, the two trains are two different cultures and ideologies, racing headlong into each other and are embodied in the roots of both Islamic terrorism and capitalism. In fact, the title of the play is a term used by the political economist Adam Smith. He used it as a metaphor to describe the sometimes unintended social benefits resulting from individual actions. Put another way, the best regulator of a market economy occurs when participants are free to act in their own self-interest. Without giving away too many Easter eggs, the story is about the kidnapping of a high-level banking executive in Pakistan by an Islamic terrorist group. The group wants ten million dollars or they will execute the hostage. Two glitches occur to thwart their plan: 1) they have kidnapped the number two guy instead of the head honcho; and 2) the group has been labeled as terrorists so the United States will not negotiate with them. The wily executive, however, manages to convince the group to let him play the stock market to raise the money to pay for the ransom himself. What follows in an incisive, stimulating exploration of not only the ins and outs of the stock market, but a study of human emotions and motivations. 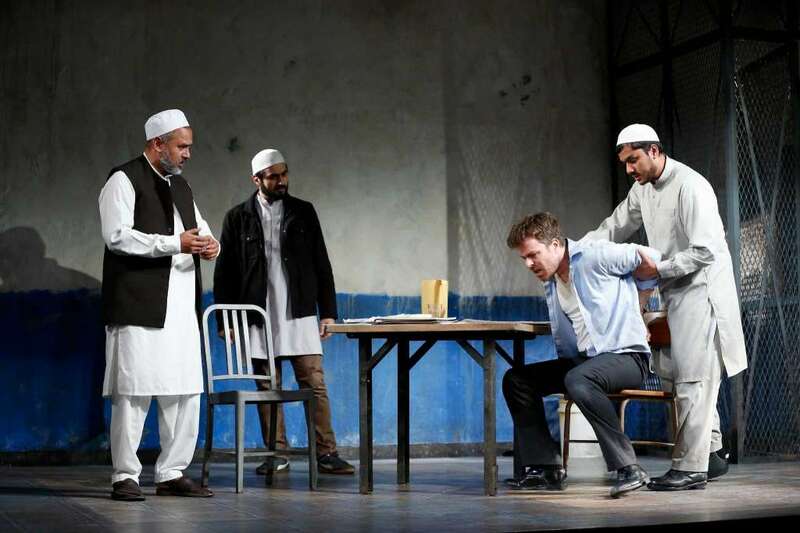 Greed versus fundamentalist ideology is certainly one of the themes of the play and whether pure altruistic motives can withstand an onslaught of riches. There are two axioms that come out of the play: Americans cannot live without lawyers and on Wall Street, both bears and bulls can survive, but not pigs — words to live by for sure. People unfamiliar with the workings of the stock market, especially with futures and selling short should not despair as Mr. Akhtar explains it all for you. It’s interesting to think that you can sell a company or commodity short, which essentially means that you are betting (and hoping) that something disastrous will happen to it. It is only one small step for someone (like a terrorist) to think that this process could be expedited and even profitable if they were somehow to help it along. David Kennedy’s direction is brilliant. The pacing, staging, and blocking operate completely in sync and serve to heighten the overall tension of the situation. There is never a point where one is tempted to sneak a peek at the watch — or the LED on the smartphone. Mr. Kennedy also has amassed a terrific cast. Eric Bryant as the unlucky kidnappee Nick Bright is simply wonderful. He plays the character with a stoic charm and an underlying fundamental idealism that is critical to his character and the overall theme of the play. His droll sense of humor and quick-witted repartee serve as some needed, yet excellent comic relief. Fajer Kaisi plays Bashir, Nick’s jailer and protégée vis-à-vis the stock market. Mr. Kaisi gives an excellent, layered performance that has the audience constantly vacillating between indicting him as an evil terrorist and hailing him as a revolutionary with altruistic goals. His disarming British accent is a neat affectation that works to ingratiate his character with the audience. Jameal Ali is spot-on as Dar, the conflicted guard. Rounding out this talented cast is Rajesh Bose as Imam Saleem, the head of the terrorist cell. Mr. Bose gives a dynamic, scintillating, powerful performance. Obviously no stranger to Akhtar’s work, Mr. Bose having played the lead, Amin Kapoor, in regional productions of Disgraced, adeptly brings a sense of rationality and idealistic persuasiveness to his role that keeps the audience guessing as to the true nature of his moral core. 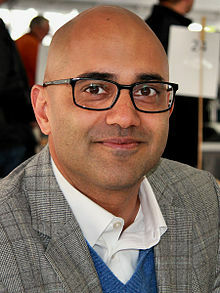 The playwright, Ayad Akhtar said that his parents offered to split his rent when he was first starting out if Mr. Akhtar would read The Wall Street Journal on a regular basis. Accordingly, to Mr. Akhtar, his parents (both physicians) were “concerned by [his] obsession with the arts and what they saw as an apparent, and complete lack of interest in the more mundane matter of the world.” Little did his parents realize at the time that they had nothing to worry about. Like Disgraced, The Invisible Hand has a lot to offer on both visceral and intellectual levels. There are no characters wearing white or black hats. There are no solutions, no answers, no panaceas to the global issues presented by the play. What is offered is brain fodder that will get you to think about the issues and themes of the play long after the curtain has come down.